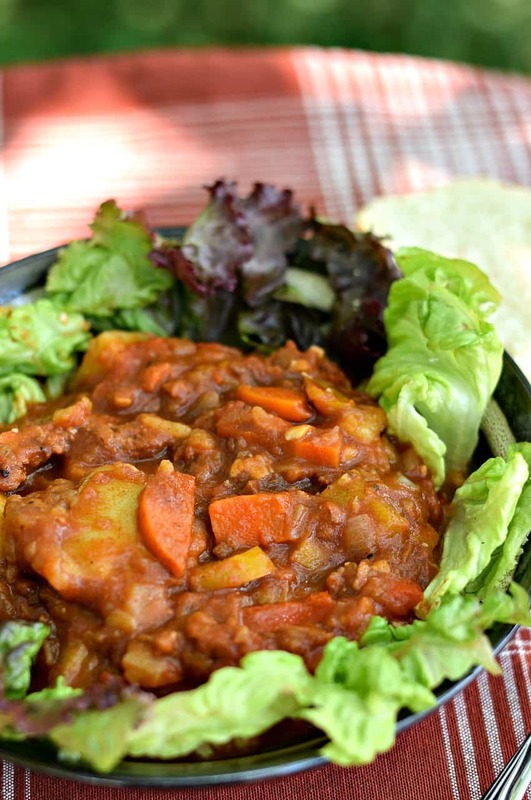 Before we get into this yummy Vegan Hungarian Goulash….. let’s first dive into a little Hungarian history, shall we? First of all, what the heck IS goulash in the first place? Traditionally – gulyás in Hungarian means herdsmen, or cowboy. So think of an old western movie with the cook stirring a big iron kettle hanging over the fire. Yep….it’s just like that. 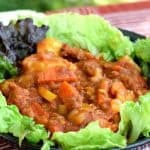 The herdsmen would cook this flavorful stew in the exact same way, adding chunks of beef, onions, green peppers, and their famous spice we now know as Hungarian Paprika. 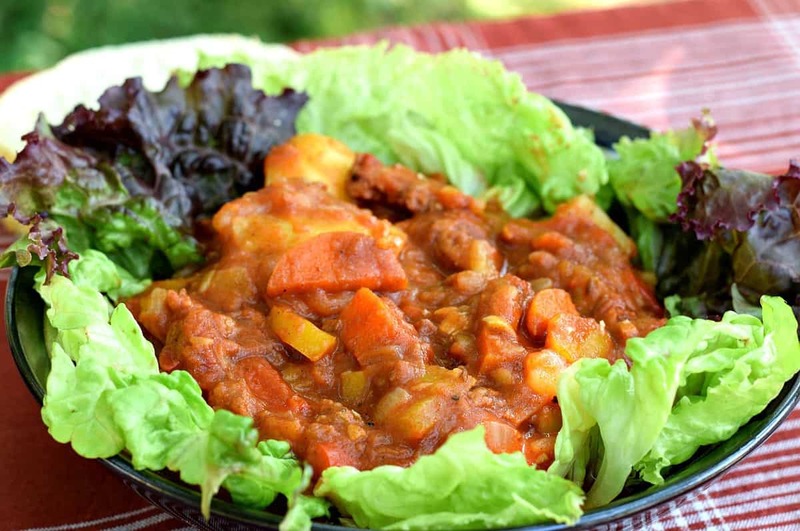 So…Hungarian Goulash is a cowboy recipe Did you know that? I didn’t. So in MY version of Vegan Hungarian Goulash, I substituted Butler Soy Curls for the meat. I also added 2 full onions, some bell peppers, carrots, fire roasted tomatoes, yukon gold potatoes, and a generous amount of Hungarian Paprika. I buy my Soy Curls directly from Whole Foods or Amazon, but if you can’t buy them where you live, you could always substitute Portabella Mushrooms or simply leave them out entirely. Now here’s the thing about this stew……. as I was making it – the outside temp here in Oregon was 106 degrees F. Yep, I’m making stew in the middle of a heat wave…..BUT, I used my Instant Pot Pressure Cooker so I wouldn’t heat up the kitchen. Not only was dinner delicious, without having to use the stove, or a million different pots and pans….it was ready in about an hour. And THAT is why I love my Instant Pot! Start by adding about 1½ to 2 cups of Butler Soy Curls to a small bowl and then cover them with hot water. I always add a few tablespoons of Low Sodium Soy Sauce too for flavoring. If you’re not using Soy Curls – simply omit this step and go on. In your Instant Pot Pressure Cooker, add 2 medium sized yellow onions that you’ve already peeled and diced. Also add a diced Green Bell Pepper AND a diced Red Bell Pepper. And finally, add 1 large Carrot, cut into small rounds. Add just enough Veg Broth or Water to prevent sticking, and then set your IP to SAUTE – LESS mode to soften the veggies…….stirring occasionally. Once the veggies have softened, add 5-6 cloves of minced garlic and stir to incorporate. Drain your Soy Curls…squeezing out any excess water – and add them to your IP along with 2 Tbs of Tomato Paste. Stir to mix,. Add 4 Tbs of Hungarian Paprika, 1 tsp of Caraway Seeds, and ½ tsp Black Pepper. Continue stirring to mix well and watch to make sure nothing is sticking. Once the liquid (veg broth, water, moisture from veggies, etc) has evaporated….and the food feels like it’s beginning to stick – turn OFF your IP and add ¼ cup Red Wine to deglaze the pan. Make sure you scrape up any browned bits on the bottom. Now add 2 cups of Low Sodium Veg Broth, ½ water, 3-4 medium Yukon Gold Potatoes…diced into large chunks, and a 15oz can of diced Tomatoes (I like Fire Roasted). Toss in 1 Bay Leaf and attach your lid. Make sure the valve is set to SEALING. Now set your IP to MANUAL mode, LOW PRESSURE, and the timer to 10 minutes. When the stew if finished, carefully remove the lid and taste for seasonings. I added ¼ salt and 3 Tbs Balsamic Vinegar. Also – if the soup is too thin and watery for your liking – add a slurry of up to 2 Tbs Corn Starch / 2 Tbs Water and stir that in to thicken. Serve it like a stew, or serve over noodles or brown rice. Be sure and let me know what you think and you can always copy my Instagram Account by adding #brandnewvegan in your photos. Stay cool and enjoy this winter treat! So what does a Food Blogger do when it's 106 outside? He makes this Vegan Hungarian Goulash in his Instant Pot! One pot, cool kitchen, delicious food! Add just enough hot water to Soy Curls to rehydrate. Add 2 Tbs Soy Sauce for flavoring if desired. Add diced onions, peppers, and carrot to Instant Pot. Set heat to SAUTE - LESS mode and soften veggies in 1-2 Tbs Veg Broth or Water. Add garlic and stir to incorporate. Drain Soy Curls (squeezing out any excess water) and add to IP. Also add Tomato Paste, Black Pepper, Caraway Seeds, and Paprika. Stir to mix well. Continue heating on SAUTE mode until liquid has evaporated. Deglaze any stuck bits with the Red Wine and turn OFF the pressure cooker. Add Veg Broth, Water, cubed Potatoes, and Tomatoes and stir to mix well. Add a bay leaf and attach lid to Instant Pot. Set to MANUAL MODE, LOW PRESSURE, and 10 Minutes. After stew is finished, carefully remove lid and season with salt and Balsamic Vinegar. Add corn starch slurry as needed to thicken. Now that so many have jumped on the Instapot wagon, I’m hoping you will still have recipes for those of us that don’t want or have one. Love your recipes! Silly question, but how do you make a corn starch slurry? I made this for dinner and wanted to bump this dish up a bit.. so I added quartered mushrooms and 2T of Harissa seasoning. Harissa has similar flavors of paprika and caraway plus enough cayenne, coriander, cumin, and mint to be extra flavorful . Great recipe ! I am German and was raised with Goulash LOL. This is a great whole plant based version and will go into my favorite recipes.